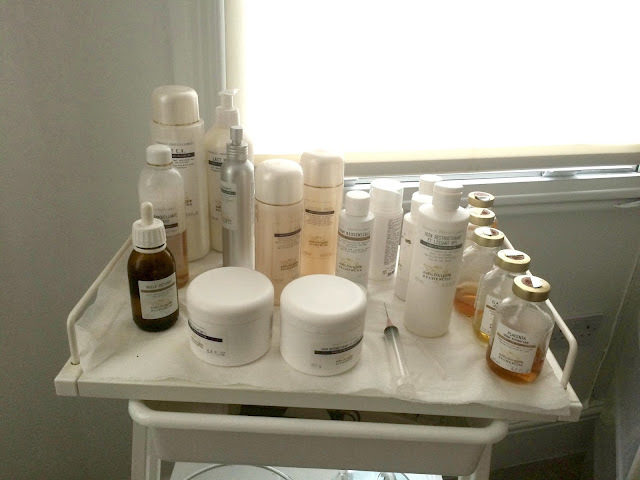 Hidden away in the midst of a busy street in Kensington was my destination for a Biologique Recherche facial, something I was really looking forward too and something I was in desperate need of. There is something deeply relaxing about a facial that allows you to wander off into the depths of your own mind whilst someone does all the hard work for you. The treatment was to last two hours and thankfully the treatment bed was exceptionally comfortable otherwise I would have been as stiff as anything afterwards. I didn't have much knowledge of Biologique Recherche before my arrival at the spa but thankfully Amy was on hand to explain more about it and it was decided that I was to have the Treatment, Soin Lissant with Re-modelling face. Biologique Recherche is a luxury, unique brand using innovative techniques alongside their products to lift, tone, re-sculpt and balance the skins epidermis. This treatment was simply incredible, much more so than I could ever put in to words, but here is how it works. I was told that it is important to understand that the skin is always changing and the correct products used at home and both in the treatment room must accommodate these changes, changes that can be the result of both internal and external factors. Correct use of products will result in a more healthier balanced skin which in turn will assist in regeneration without the need for a direct focus on ‘anti-aging’ skincare. The protocols of your professional treatment will always start with a thorough diagnosis of the skin through analysing to ensure we are treating your specific ‘skin instant’. The treatment begins with Initialisation which involves cleansing, balancing and gently exfoliating the epidermis. Biologique Recherche products contain active ingredients that will prepare the skin to receive highly concentrated, active formulas within our final treatment stage to moisturise, stimulate , revitalise, balance and protect. There is no fruity or floral scent that you might usually associate with having a facial, these products are incredibly soothing and gentle on the skin. The key products which were used during my facial was Lotion P50W which is a gentle continuous exfoliation containing hydroxy acids to exfoliate, hydrate and balance as well as Arnica to sooth a sensitive skin. Masque Biosensible is a highly complex masque working to detox, moisturise and protect. packed full of anti-oxidants as well as soothing milk proteins. Your ultimate masque to balance a skin that is feeling a little sensitised or sensitive. Serum Amniotique E soothes an irritated skin whilst intensely hydrating the layers of the epidermis to repair, regenerate and protect. The specific professional treatment is designed especially for a more sensitive, stressed skin that is need of strengthening and repairing. Packed full of omega 3 and 6 as well as hydrating hyaluronic acid and natural amino acids to hydrate, renew and protect. Along with this reconditioning booster treatment the use of a re-modelling face machine which combines the power and synergies of electrical and high frequency current to improve the quality of the epidermis, promote product penetration of Biologique Recherche products as well as having an immediate and lasting lifting effect. The electrical charge part of the facial wasn't in anyway uncomfortable, I was warned that I might have a metallic taste in my mouth for a few minutes, which I did, but this soon went and as the charge is being used, the sensation, though quite an odd feeling, I find to be a nice sensation and not at all painful. The facial ends with a specifically tailored cocktail of serums followed by a cream and finishing serum to end this bespoke treatment treating your individual ‘Skin Instant’. 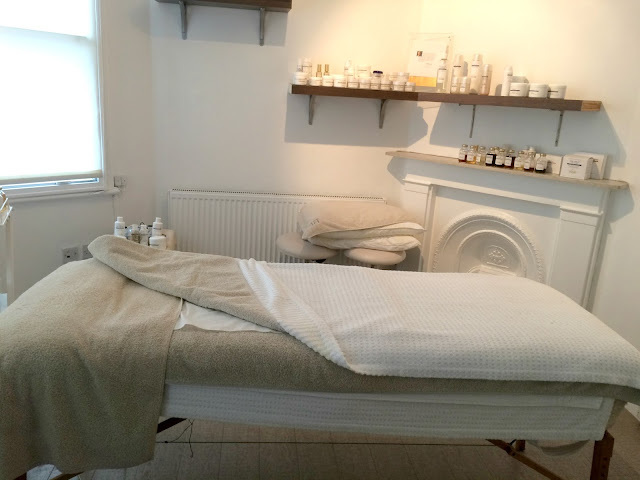 I could have quite happily laid there all day and let Amy work her magic, my skin was really dry and in need of hydration in places before the treatment started and afterwards my skin was just glowing and felt incredible. A facial of this nature doesn't come cheap and as it was very much tailored for my needs at the time, there is no price that I can give for it, but you can find out more about each facial here along with details of your nearest spa for treatments. I have never had a facial before and never really considered having one but after reading this post I want to find my nearest spa and have a nice relaxing and worthwhile facial. I love going spas, but usually go for massages. I'm not one for facials as my skin is so sensitive, but maybe I will have to try! A two-hour treatment sounds absolutely bliss. And I'm sure my skin would benefit from these products, especially as winter is coming. This looks like a good place to relax. I must admits I've never been to any spa before or even had any facial done. Maybe I should try it. I've always been worried about having a facial due to skin flare ups but this sounds blissful! I've never been to a spa before and this just sounds so lovely! I have never had a facial or even been to a spa and this sounds amazing and something my skin is desperate for it sounds so amazingly luxurious! I've never had a facial but I love the idea of this being so tailored to your specific skin requirements and concerns! My skin is really dehydrated at the minute. Can't wait to get my facial on soon, it's long overdue! Now that I think about it, I haven't had a facial for awhile. Yours sounds like a bliss! I have never had a facial. I wouldn't even know where to start. It sounds nice though. This sounds amazing, I would love to do something like this, but it's getting the time! ahh this sounds so amazing! !